Clinical urological surgeon Dr. Jonathan Makanjuola will be available at Northshore Medical & Aesthetics Centre from February 16 to February 22 in order to address erectile dysfunction with patients. 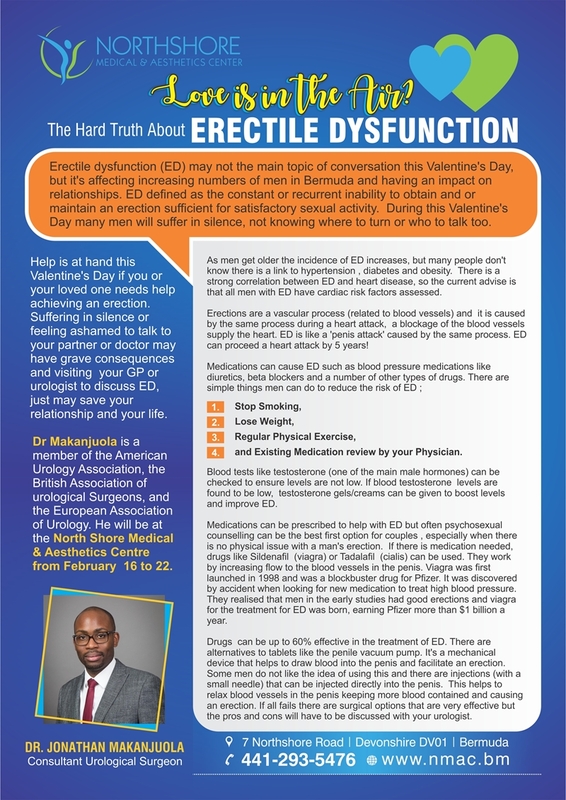 A spokesperson said, “Erectile dysfunction [ED] may not the main topic of conversation this Valentine’s Day, but it’s affecting increasing numbers of men in Bermuda and having an impact on relationships. During this Valentine’s Day many men will suffer in silence, not knowing where to turn or who to talk too. “Dr Makanjuola is a member of the American Urology Association, the British Association of urological Surgeons, and the European Association of Urology. He will be at the Northshore Medical & Aesthetics Centre from February 16 to 22. “As men get older the incidence of ED increases, but many people don’t know there is a link to hypertension , diabetes and obesity. There is a strong correlation between ED and heart disease, so the current advice is that all men with ED have cardiac risk factors assessed. “Medications can cause ED such as blood pressure medications like diuretics, beta blockers and a number of other types of drugs. There are simple things men can do to reduce the risk of ED, including stop smoking, lose weight, regular physical exercise, and an existing medication review by your physician. “Blood tests like testosterone [one of the main male hormones] can be checked to ensure levels are not low. If blood testosterone levels are found to be low, testosterone gels/creams can be given to boost levels and improve ED. “Medications can be prescribed to help with ED but often psychosexual counselling can be the best first option for couples , especially when there is no physical issue. If there is medication needed, drugs like Sildenafil [viagra] or Tadalafil [cialis] can be used. simple edible can fix that too.